Join us for Pansy Day on April 13th! Why did the Needham History Center & Museum decide that Pansies deserve a place in the history of the Town? Although farming in Needham is mostly in the past, Needham once had a busy agricultural economy, growing a wide range of produce. Around 1900, one important product was flowers for the markets in Boston and beyond. Pansies were one of the flowers grown in Needham, and were shipped daily to Boston, and weekly to the White House in Washington. Needham’s “Pansy King” was Denys Zirngiebel, a commercial grower whose home and greenhouses were on South Street. Zirngiebel came from Switzerland, and he arrived in this country with a vast knowledge of botany. He grew his pansies commercially for decades, developing numerous varieties. His premier product was the Giant Swiss Pansy, which often displayed blooms more than 4 inches across. In May 1888, he took First and Second Prize, and a Silver Medal for his pansies at the Massachusetts Horticultural Society exhibition. He sold his plants and seeds to commercial growers all over the country. Zirngiebel is famous not only for his pansies, but because he was the grandfather of another important Needhamite, the great illustrator N. C. Wyeth. Zirngiebel’s daughter, Henriette, married Andrew Newell Wyeth, who owned a grain business in Charlestown. Andrew and Henriette Wyeth were the parents of Newell Convers Wyeth. The Wyeth home lay next door to the Zirngiebel home on South Street. Both homes can be seen in Wyeth’s work. 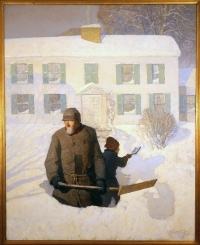 The Zirngiebel home, and Denys Zirngiebel himself, were the subject of Wyeth’s painting, “Christmas Morning”, which is in the collections of the Needham Historical Society. The charming Pansy was therefore a natural choice as an emblem of Needham’s history. The Town of Needam has declared April to be Pansy Month, and the Pansy to be the official flower of Needham. The Needham History Center celebrates April with a Pansy Sale, and the Annual Pansy Festival at their Central Avenue headquarters. We look forward to the day when every home in Needham has its pocket of pansies . . . and a growing interest in Needham’s History! Pansies are a low-growing early flower. They have a long blooming season if they are planted in a cool place and not permitted to dry out in the hot summer sun. They can be planted as early in April as the ground permits. The plants will flower well into June, and longer if the dead flower heads are regularly picked off. Sometimes pansies will reseed themselves. The Needham History Center & Museum offers pansy flats for sale every year during the month of April. Please call 781-455-8860 for information.